I have been nominated for the “I’m Not Featured On Freshly Pressed” award by Let Me Reach with Kim Saeed (yay!). I’m still brand spanking new to the whole blog awards thing, so it still takes me a little bit of time to calm myself down and get back to normal breathing. Having said that, I really don’t think that it’s something that I’m ever going to get used to because of how much it means to me. Everyone has their reasons for blogging. Some want to help educate others, some are a form of self-therapy, some to be a resource, some to promote a business, some are about their hobby, etc. Each reason is just as valid as another. I have various reasons that I blog. I have a deep need to share the things I learn with others. But the blog itself, is the culmination of many years of hard work in overcoming my fears of self expression and being noticed. And when I say fears, I mean TERROR. Once upon a time, when I would attempt to creatively express my thoughts, I would just go mute. My throat constricted and I wasn’t able to even attempt to speak. It didn’t matter if I was trying to verbally speak, or even trying to write in a journal while I was alone . . . the ability to communicate my personal feelings or thoughts was just not possible. I would instead just talk about things that were trivial, or I would focus on the other person in the hopes that the conversation didn’t turn to me. If it did, I would either go into the deer in headlights look O.O . . . or talk around it until the person was distracted away from me. I spent the first 3 decades of my life mastering the art of invisibility. “Please don’t see me.” If attention in any form were to be directed at me, my mind would go blank and my face would turn scarlet red. Meetings at work were the worst. During the most intense of those moments, I mostly focused on trying not to puke or faint in front of everyone. Later, once I was alone, tears were sure to follow. The journey to here, to where I now blab my ever loving head off to anyone who happens to find their way into my little spot on the internet, has been years and years of persistent pushing and healing of myself. And the blog awards are a double-edged sword to me. 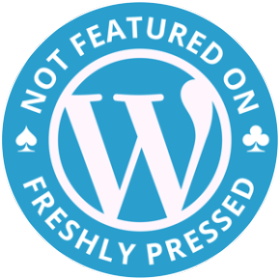 So would I *like* to be on WordPress’ Freshly Pressed? On the one hand, it would be a hallmark in my journey of self healing. Saying to me, “Look me! Look how far we’ve come!” (<– I used to be concerned that I sometimes refer to myself in the plural. But I figure, hey . . . at least I’m not alone.) On the other hand, that level of attention (assuming it brought the level I’ve seen on other blogs) would probably require that I breathe into a brown paper bag for at least a week to keep from moving into full blown panic. So thank you so much, Kim Saeed, for this nomination and for inadvertently being a part of my journey of self healing. The nomination both scares the poop out of me, as well as makes me cry . . . and motivating me to keep pushing forward. I appreciate you thinking of my blog when you were choosing people to nominate. That makes me feel pretty special to be *seen* by you.